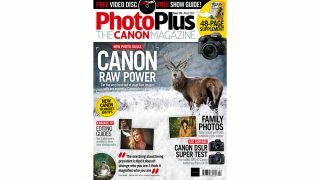 The new issue of PhotoPlus: The Canon Magazine is on sale now – as well as arriving in subscribers' postboxes too. The new March issue 149 of PhotoPlus: The Canon Magazine is on sale and it's crammed with new Canon skills, tutorials and tests to help you become a better photographer! In this issue we bring you the definitive guide to Raw, from the benefits over JPEG, to setting up your Canon camera and Raw image-editing advice, you can learn it all. Also inside this issue, Children, Family & Lifestyle Photographer of the Year, Nina Mace, teaches our Apprentice how to capture great winter portraits of the family, even when it’s cold outdoors. We get to interview the amazing Pete Souza, former chief White House photographer, who had unhindered access to photograph Ronald Reagan and Barack Obama during historic moments. As well as an enviable portfolio, Pete doesn’t pull any political punches when talking about Trump. Pete Souza will be talking on the Super Stage at this year’s Photography Show at the NEC, see www.photographyshow.com for how to get your show tickets for 16-19 March. In our inspirational Canon Skills section, learn how to shoot and shrink a subject with a combination of camera and Photoshop techniques; capture professional headshots with one light in small space; plus old-school Hollywood photo skills. Plus in our Canon School section, learn how to make the most of lens filters for more creative images with your Canon gear. Plus we test five APS-C Canon EOS DSLRs, starting at only £419 for the 2000D with an 18-55mm kit lens!